May you find joy in memories and peace during this time. 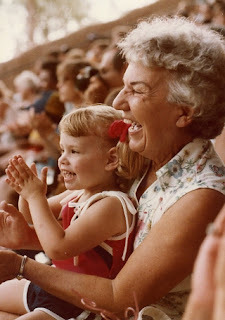 My grandma, an incredible woman, passed away several years ago and I still miss her incredibly. What I've realized is that the fact is, she left an incredible legacy. I can only hope to leave one half as meaningful as hers. Sounds like your Grannie will be leaving a great legacy, too. 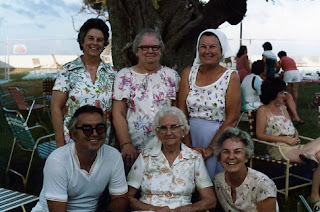 I have a copy of that same picture!...all the sisters, Nonnie, and Uncle Billy...makes me teary eyed sometimes seeing how young they all look here. As I was praying for you and for her last week, I was also thinking how it would be fitting for her to die on Easter. The Lord told me she would. I am sorry, as I know how much you are grieving, but she is home now. She is not in pain and not suffering anymore. She is with her husband. She is with Jesus. She went home on such a joyful day, the day Jesus suffered and died for us. Grannie's body is gone, but she still lives in you, just as Jesus lives in us all. You will keep her spirit alive, and pass that spirit on to your girls.